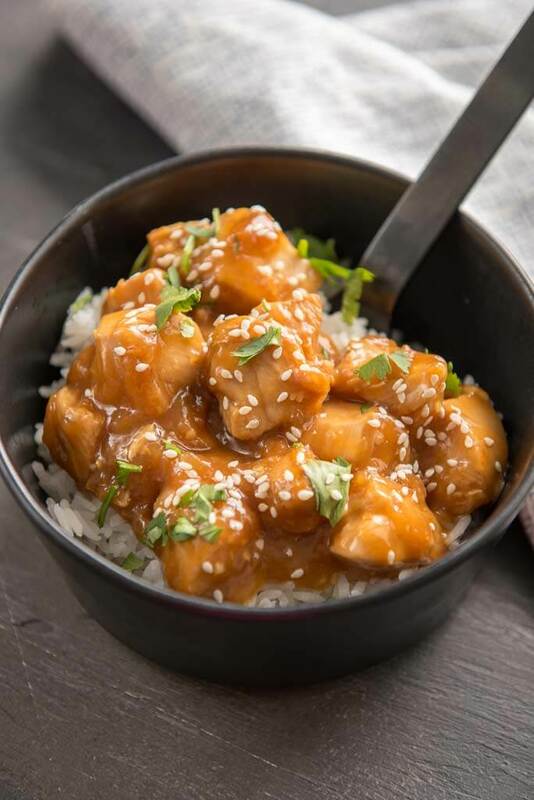 If you need a quick and easy dinner that will please the family but still saves you from take-out, try this Instant Pot Sesame Chicken. Easy prep, quick to cook and sure to be enjoyed! Current obsession = making versions of our favorite take-out food at home! Whether I use my slow cooker or my pressure cooker, I find that making dishes like this at home is simple and saves me money and lets me control the ingredient list. 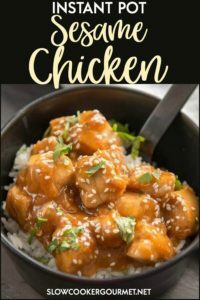 Cooking at home makes me feel better all the way around, and with meals like this Instant Pot Sesame Chicken, it’s so easy that you can even cook at home on busy evenings! My family goes nuts for any dishes like this that can be served over rice. Chicken is obviously always a good answer, but if your family likes beef, this Mongolian Beef in the slow cooker is also delicious! What is sesame chicken made out of? While it’s usually breaded and deep fried, we are going to skip that part to make it healthier and easier. I don’t think you miss out on a single thing without all the breading and oil! 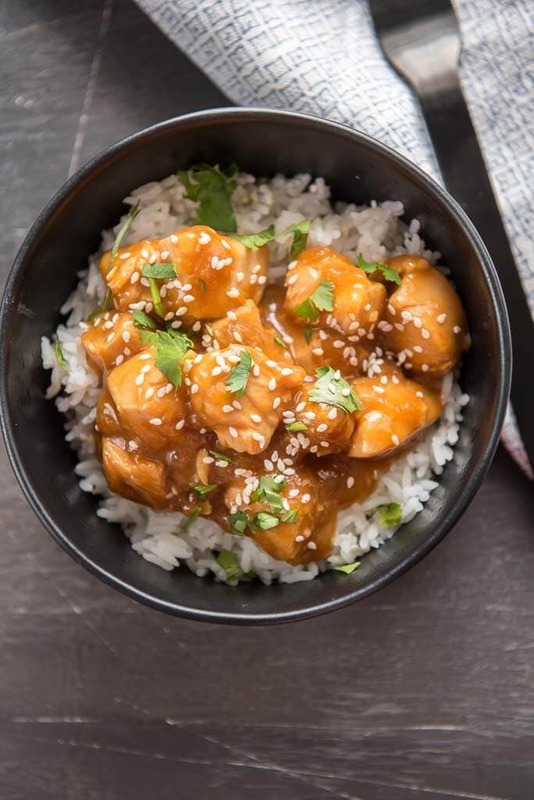 Can I make this sesame chicken in my slow cooker? Yes. I would add about 1/4 cup more broth to account for the evaporation and you may want to transfer the sauce to simmer on the stove with the cornstarch before serving. 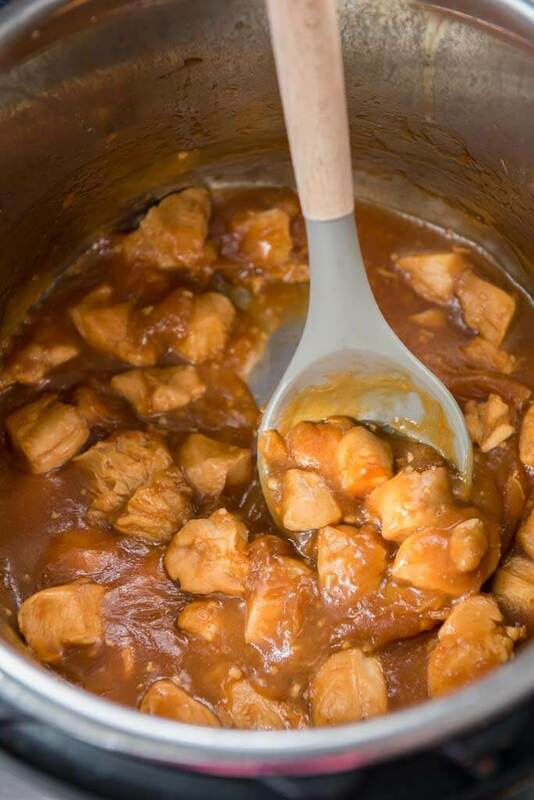 Depending on your slow cooker, it should take around 3 hours on high or 6 on low. Is an Instant Pot or pressure cooker a good addition to your kitchen? I think so!! It’s great for dinners like this when you don’t have time to plan ahead and don’t want to waste time, money and calories on eating out! I am going to have to figure out the simmer option on my Instant Pot. I am sure it is there somewhere. Hi Diane! Yes!! I’ve actually been working on setting up this option for my recipe cards! Hopefully I’ll have it working soon. I’m relatively new to the Instant Pot and have had a few unfortunate fails lately. Luckily that wasn’t the case with this recipe!!! Easy, quick and delicious—this dish will be joining my family’s weeknight rotation. Thank you for the great recipe! Both quick release and natural pressure release are referring to the Instant Pot or other electric pressure cooker, not the slow cooker. It’s how the pressure that cooks the food so quickly is release safely from the pot.